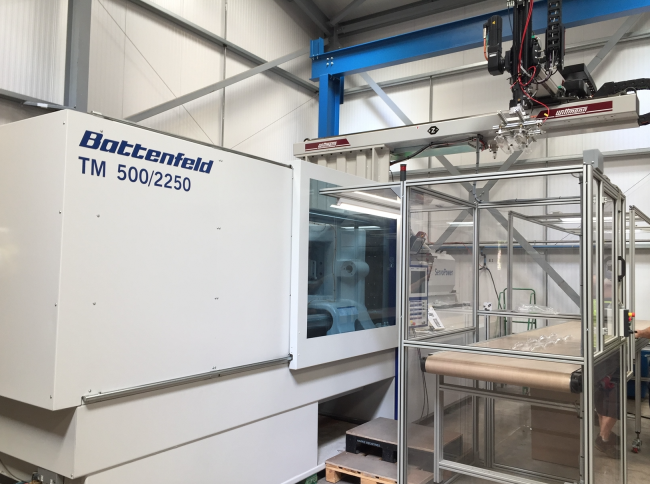 Leading contract moulder LGG Charlesworth (LGGC) has recently completed half a million pounds worth of investments with the purchase of a 500 ton injection moulding machine from Wittmann Battenfeld UK which will support the company’s continued growth. During this time, a wealth of experience and knowledge has been gained within a number of key market sectors including Automotive, Aerospace and Electronics, with the company amassing blue chip clients such as Racal, JLR and Rolls Royce. The current wave of LGGC investment and expansion in the past 12 months is aimed at creating further capacity and driving standards and performance even higher. The new Wittmann Battenfeld purchase is intended to boost the company’s capabilities in the supply of larger parts. LGGC Commercial Director, Shaun Champion, says: “Our Wittmann Battenfeld 500-ton press was selected following a detailed exercise that compared the current market offerings. The key features LGGC looked for in its IMM machine purchase included low energy consumption and the ability to be able to monitor and control energy usage. LGGC also had a specific requirement for a machine with a small footprint. “The new Wittmann Battenfeld press fits this available space quite literally,” continued Champion. Another key feature sought by the LGGC team was to have all production cells fully integrated and utilising the latest Industry 4.0 technology. LGGC’s own approach in meeting high standards through relevant processes and systems is second to none. This is playing a key part in helping LGGC to secure major new projects.